WeChat is a very popular messaging app. However, those who have used WeChat or are using it on iPhone, will be well aware of the fact that there are simply a great deal of messages being sent and receive on a daily basis. Ever wondered where do these messages get saved? With so many messages being delivered daily, your iPhone’s memory is the one that gets the hit. The messages are saved in your phone’s memory and before you know it, your iPhone memory is full. As such, one reason to delete WeChat history from iPhone is to save storage space. Furthermore, deleting things also improves the performance of iPhone and the app as well. Lastly, it is a good idea to delete private conversations in order to ensure iPhone security. How to Delete WeChat History on iPhone? You may use WeChat itself to delete WeChat history for your iPhone. It is a convenient way to speed up your iPhone and save a lot of memory. Below you will find the steps needed to delete these messages. Step 1: Open WeChat and go to “Me” tab. Step 2: Go to Settings and tap on “Chat”. Step 3: Select “Clear Chat History”. Will Previously Deleted WeChat History Lead to Privacy Leakage? Most of us may think that simply deleting WeChat history through WeChat is enough. Well, this may be true to some extent. If you have only a few messages that have no private information in them, then deleting as such will be more than enough. However, WeChat is an app that has users who communicate sensitive business or private information. You may be using WeChat to discuss strategies, financial matters and much more. Such sensitive data needs to be deleted as soon as possible. However, deleting in the normal in this case is not enough. The data can be retrieved easily using various data recovery software and can be exploited against your interests. Therefore, such deleted history can cause a major privacy leakage. iMyFone iPhone WeChat Eraser or iMyFone iPhone WeChat Eraser for Mac can provide you with the solution that you need. 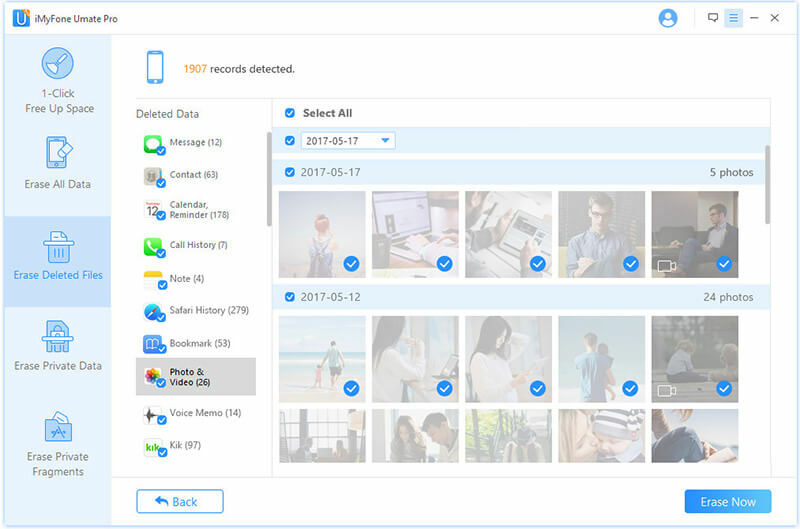 With an intuitive and incredibly easy-to-use interface, iMyFone is a perfect iPhone data erasing tool that will ensure your privacy is intact. Erase WeChat messages: You may use the app to delete all WeChat messages in one go. Erase WeChat photos & videos: WeChat attachments (photos and videos) can also be erased permanently. Erase all WeChat private fragments: This ensure that all sensitive WeChat traces will be wiped off your iPhone. 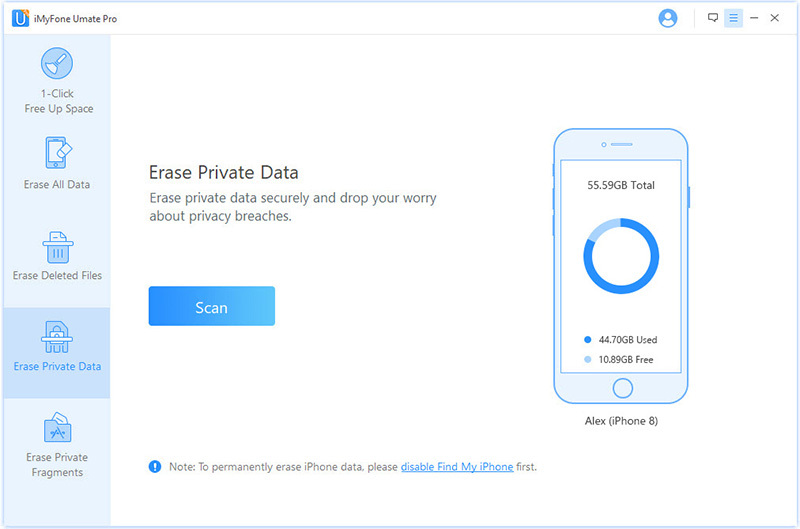 Erase also previously deleted WeChat data: This feature lets you erase deleted files permanently making sure that you are completely safe and secure. 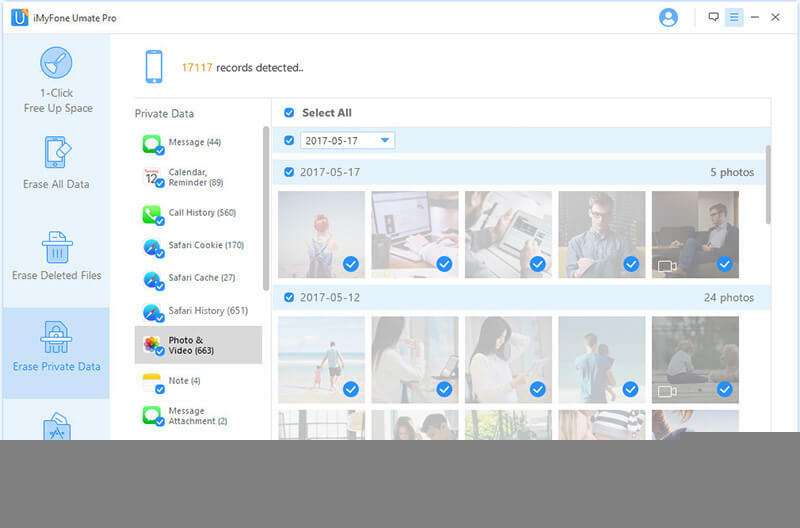 In addition, iMyFone Umate Pro lets you preview files before you can erase them. This means you can individually select the files that you want to remove and erase them simultaneously. As such, you do not have to worry about other important files getting deleted. Follow the steps mentioned below to permanently erase WeChat history. Step 2: Click “Erase Private Files” and select “Scan”. iMyFone will start scanning your device for all the WeChat histories. Step 3: Once scanned, all the data will be displayed. Select the file category that you want to delete and click “Erase Now”. Step 4: Type in “delete” to confirm and select “Erase Now”. As mentioned earlier, WeChat message history may contain some very vital and sensitive information. Deleting it in the normal way is not going to do any good. It is very dangerous as the information can be accessed through various sophisticated hacking techniques. So, we’d better permanently erase the private WeChat history from iPhone.